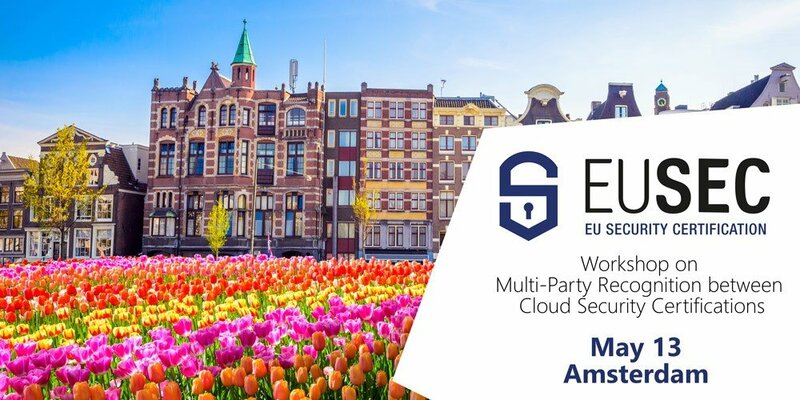 On May 13, 2019 a workshop on the new "Multi-Party Recognition Framework" will take place in Amsterdam. The event is hosted by the EU-SEC project and supervised by FOKUS scientists among others. The event focuses on working with the newly developed “Multi-Party Recognition Framework” (MPRF), which summarizes the enormously increased number of requirements in the regulation of cloud services. The number of different standards and laws in the field of cloud services on a national, international and sectoral level is steadily growing. The complex regulatory system makes it ever more costly for cloud service providers (CSPs) to be present on all markets. The growing costs for certification are in many cases passed on to the customers of the services. The EU-SEC project builds on the recognition that many conditions for meeting the different standards are very similar. Based on this finding, the “Multi-Party Recognition Framework” was developed. The aim of the framework is to keep the barriers low for CSPs in the certification process. By summarizing the requirements of different certificates and standards with the MPRF, once an initial certification has been obtained, future certificates can be obtained more efficiently in other markets, thus creating an easier overall process. The goal of the awareness workshop in Amsterdam is to demonstrate the functionalities of the framework to the participants. In addition, the different Tools of the MPRF, the underlying requirements comparison methodology and the advantages for users and providers of cloud services will be presented. The workshop is intended for CSPs, cloud services customers, certificate issuers and audit firms. Participants should have working knowledge in the field of cloud certification. Participation is free, however, due to limited space, registration is required in advance.